If you haven’t been to Tijuana in a while, now’s the time to come for a visit. 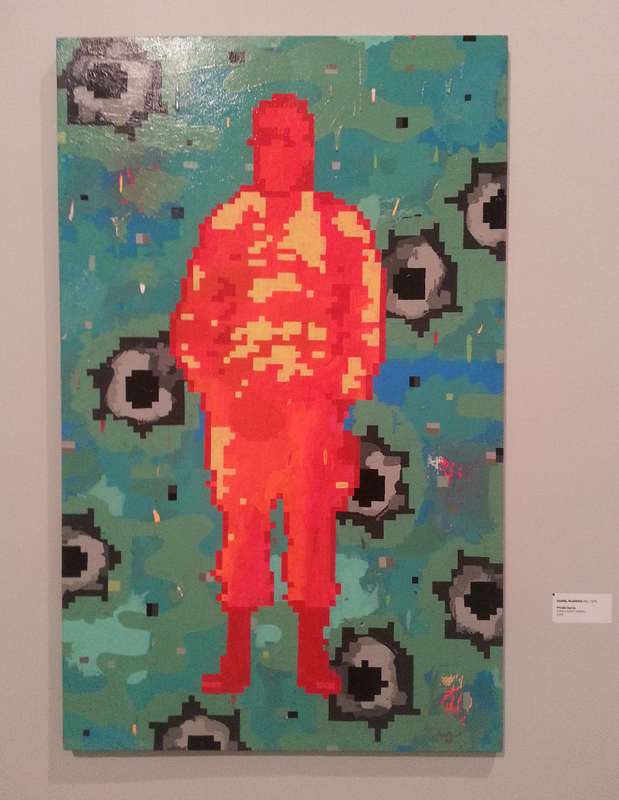 The show “Collection of Elias-Fontes Historia y Relato” (History and Story) at CECUT, The Centro Cultural of Tijuana in Zona Rio, is an exhibition that asks serious questions about the role of the artist in the context of the relentless, pulsating vitality of contemporary capitalism. Bringing together the work of a generation of northern Baja California artists, the work is remarkable for its variety of materials and forms: metal, industrial refuse, adobe, ceramic, fabric, found objects, and acrylic paint formed into collage, photography, video, sculpture, ready-mades and installation. The exhibition as a whole, through its materials and forms, expresses a dynamic very particular to Tijuana, and our Northern Baja California region: a continuous flow, repetitive, uninterrupted, that is materialized and expressed in pure form. This is a collection of works whose significance is based in the materials of everyday life. The grotesque, the montrous, the uncomfortable fusion of possibility and destruction, amalgams and cyber-creatures. In spite of taking on intense and even brutal themes–of the relentless rhythm of the factory, of the subjugation of the body, the pummeling of the aesthetic itself by the forces of capital–this is neither cynical nor sentimental work. The show doesn’t reject the sublime in favor of the quotidian. Landscape in the form of a metal border wall, portrait expressed as pure body, environments in fragments of wood, glass, and industrial plastics reassembled into ready-mades. 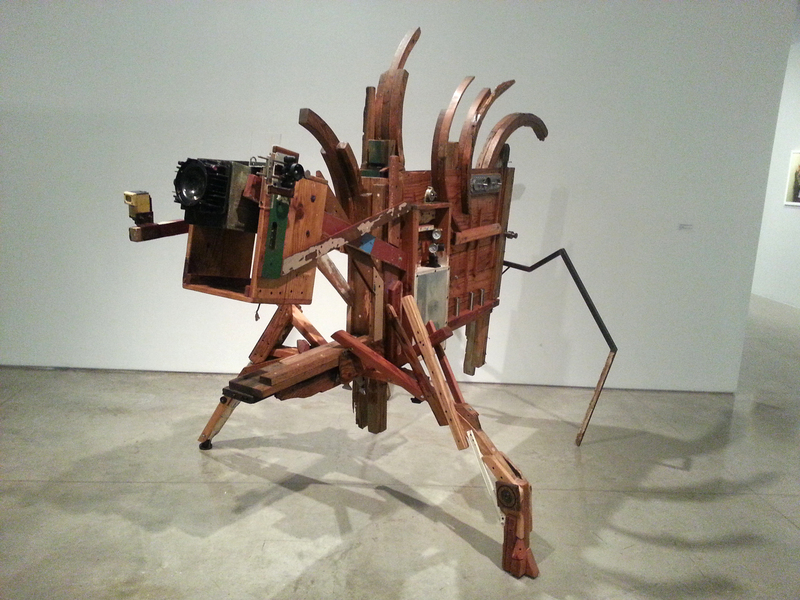 One central piece in the collection is “Transmutante,” by Alejandro Zacarias, a strange and surreal horse/machine constructed of scrap wood, industrial refuse, and lenses. Recently featured in the December 16 issue of Art Collector World Magazine, as the author of that review points out, the work of Zacarias truly stands out. But this isn’t a show about individual artists or who is the best. 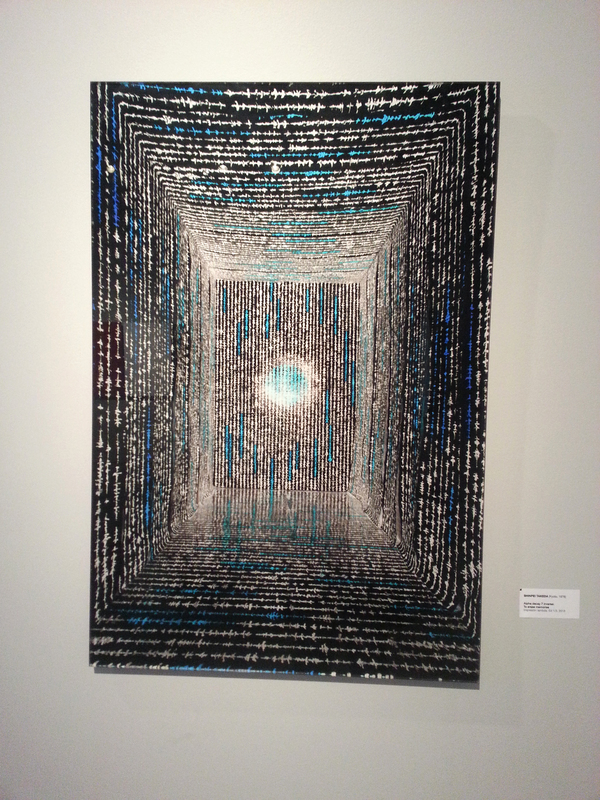 Rather, a genuine creative engagement amongst the curator, collectors and these works, is evident here. Entitled “Historia/ Relato” or “History / Story” in English, under the curation of Alejandro Espinoza Galindo, the show links personal story with the dynamics of history, of the languages and forms of contemporary art, of space, place and geography. This is a collection of works whose significance is based in the materials of everyday life. The grotesque, the montrous, the uncomfortable fusion of possibility and destruction, amalgams and cyber-creatures. And Espinoza’s curation leads the museum visitor through this journey, organizing the works in broad, interrelated categories. Located in the entrance to the second gallery, “Transmutante” by Zacarias is a bridge, a point of transition between Processes/Actions and Portraits/Figures and Environments, inviting the visitor to embrace the discomfort of deformity, of mutation, as a condition of our contemporary existence. Another principle work marks the transition between the second and third galleries: a diptich of photographs by Ingrid Hernandez, an abandoned factory. Through the colors and light, the photographs capture extremes: obscurity and radiant light, black and white, even day and night in the points of light shining through holes in the walls which from a distance look like stars in a night sky. Hernandez uses the material of the abandoned factory to create a space-time image, one as Deleuze would say, creates other worlds, other possibilities. The metal walls, the blackness, the contaminated and abandoned space evoke the brutality of the maquiladora, the instrumental logic of capital that comes and then is quickly gone, and at the same time evokes the future possibility of this same space. These two works serve the same purpose: to situate the dynamic of the uncomfortable, repetitious creation/destruction of contemporary life under capitalism within the space-time of the museum itself. This is work that expresses the necessity to confront the impossibility of the present with acts of creation, work that argues that through creative activity we can generate new possibilities out of the impossibility that we are living through today. For Tijuanenses, and for anyone with a will to resist, we will indeed recognize ourselves in this collection. Jill Holslin is a writer, photographer and lecturer of rhetoric at SDSU living in Tijuana since 2011. Holslin has published her photographs in books and magazines in both the US and Mexico, and exhibited in both group and solo shows in Tijuana and San Diego, Chicago, Minneapolis, in Guatemala, El Salvador, Costa Rica, Mexico City, and most recently, in Buenos Aires, Argentina. She has published arts and culture features for San Diego CityBeat, San Diego Red, and UNIEKEST in Los Angeles, and uses her website At the Edges.com as a platform for art and research projects. You can read more of her work here. Terrific, informed writing combined with keen observation. Jill, it’s great seeing your review at SDFP. I’m looking forward to more.